Steve is a fully qualified gardener, gaining his City and Guilds of London Institute phase one and two in Horticulture and Phase three in Enterprise Management. He gained his NVQ Assessor Awards to enable him to assess candidates in their National Vocational Qualifications in Horticulture. Steve is an advisor for the Food For Life Partnership and became National School Food Hero in 2006. He is a Guinness World Record holder and founder of the Award Winning Haworth Primary School Gardening Club. His other awards include Community Star Award, Dalesman's Rural Action Award and a Paul Harris Fellowship from the Haworth and Worth Valley Rotary Club. 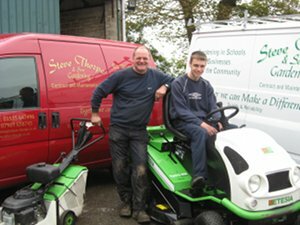 Joe is a fully qualified gardener, attaining a distinction in gaining his National Diploma in Horticulture studying at Askham Bryan College in York. During this time he became a member of Askham Bryan Young Gardeners of the year team, who built a show garden at the Ideal Home exhibition at Earls Court in London. Joe has attained his PA1, PA6 and PA06A in spraying, level 3 hedge cutting, landscaped based machinery and tractor driving. He is in the middle of his foundation degree in landscape and garden management.